The woven poppy styles that are pictured below can be woven for you in the size and colors of your choice. Tina always has some woven flowers available for immediate sale. 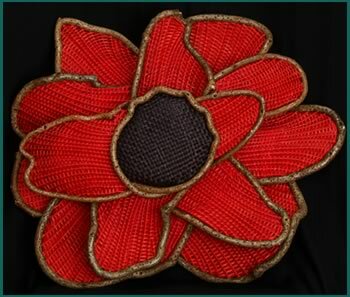 Please contact Tina directly to make a purchase or commission a custom-woven poppy. H 23" W 23" D 4"
This very elegant and graceful poppy will brighten your wall with its brilliantly colored red petals and black center. It is framed out of bittersweet vines and the center is done with reeds and beads. Tina wove the petals of this poppy wall sculpture in the multi-layer weaving technique she developed herself and calls "Dimensional Weaving." A true beauty to behold! View enlargement of construction detail. H 34" W 35" D 8"
Framed from bittersweet, the petals of this giant red poppy are woven in red-colored reeds, with the center of the poppy woven from black reed. 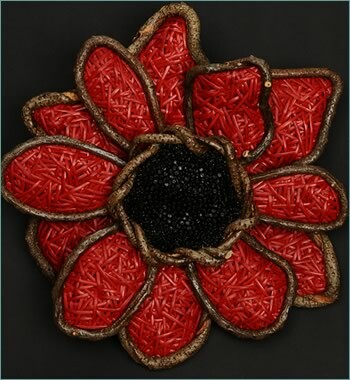 Hanging on the wall, this somewhat three-dimensional woven flower sculpture is truly striking to behold.